A Boston Food Diary: Toasting the Emmy's- Give Away! I have been loving my collaborations with the great folks at I Can't Believe It's Not Butter. It seems they are hosting fun Twitter parties, or producing great giveaways! Well today-they are doing both! Tonight, between 8:00 pm EST and 10:00 pm EST they are hosting a Twitter Party to celebrate the Emmy's which will air on Sunday, September 18th, 2011. So what exactly is a Twitter Party? Well it's recipe sharing, party tips, chatter about your favorite celebrities and TV shows...it's a virtual gathering of pals- and all you need to get involved in it is Tweet under hash tag #Toast2TV. Rumor has it- there will be some pretty fab prizes given out as well- so you'll definitely want to check in and see if you can win! I was sent a little goody box full of delicious recipes and other goodies in preparation for this evening -I can attest that there are some great dishes to be made with I Can't Believe It's Not Butter! They aren't stopping there though- oh no- the fine folks at I Can't Believe It's Not Butter have offered to host a give away right here on A Boston Food Diary! This is a week of big stuff happening here, so I thought this would be a perfect way to kick it off!!! So what is this give away all about? I won't lie-it's pretty major! 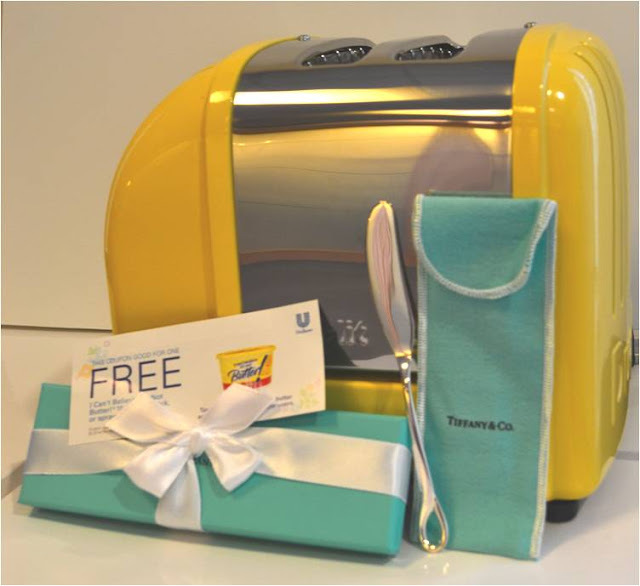 It is my very firm belief that there is no better toaster out there than a Dualit- so this is a pretty fantastic prize! And really- combine that with a beautiful spreader from Tiffany & Co., and some delicious I Can't Believe It's Not Butter- phenomenal! Total value of this prize is over $350! All entries must be received by 11:59 pm EST on September 18th. I'll reveal the winner by noon EST on Tuesday, September 20th. So get those entries in- this is a prize you do NOT want to miss! Wow, how out of it am I that I didn't know about the Emmy's this weekend?! I want Boardwalk Empire and 30 Rock to rock it! And my favorite party food is anything bite sized - whether it be goat cheese tarts or mini blondies. I'll definitely be "toasting" on Sunday during the Emmy's! I have to be behind Glee 100%! Woohoo! Nachos are probably my favorite, because they are easy and can sit out for a while. But my true love is jalapeno poppers, or a cheese and meat plate! Thanks for such a WOW!! of a giveaway! Favorite party food -- how can I choose? Definitely anything with cheese! I'll be toasting the Emmy's this Sunday! My favorite party foods ....those spicy meatballs, lots of yummy dips with a variety of crackers and chips ....and the powdered sugar coated wedding cookies. I'll be toasting Kyle Chandler from Friday Night Lights! I hope he finally wins! I love little smokies for parties. They are so tasty and easy to put in the crock pot! i think i love cheese and crackers and summer meat. I will most definitely be 'toasting' the Emmy's. Great giveaway and happy I found your blog! My favorite foods are appetizers! Finger foods that are easy to eat and soooo good! Favorite party fun is hummus! I'd love to see Louis C.K. win as best comedic actor. Favorite party food: pigs in a blanket! Tonight I'll be toasting Boardwalk Empire, The Killing, Downton Abbey, Nurse Jackie, Law & Order, glee and SNL. Almost all my favorite party foods, like Miniature Tuna Melts that kids and grownups just love, come from Barbara Kafka's aptly titled book PARTY FOOD. I'll be "toasting" the Emmys with cheeses from Formaggio Kitchen and Sixpoint Rightous Rye. Fingers crossed for Boardwalk Empire and The Killing. Ohh I'll be making spinach dip! Yum! I love modern family so I'll be rooting for that. I love Shemar Moore from Criminal Minds. Fave party foods are cheese, nuts, fruit, veggies, chicken wings,and cake.